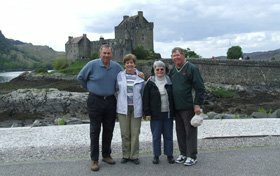 “We had the trip of a lifetime all arranged by Golf Vacations UK to Scotland. There were two couples – the men played five days of golf on great courses and the women went sightseeing to great places – castles, palaces, chapels, cathedrals. We had a wonderful driver/guide who indulged our every whim making us feel so comfortable that we wanted to adopt him and take him home.